however i think violent protests are really inacceptable..tell me what you think..bas eno its good to protest peacefully against something you don't like bas violence is inacceptable.. Regarding this Danish cartoon issue, it was very wrong to publish these cartoons and trigger all this outrage in the Muslim world...I call this racism not freedom of speech. well it is not peaceful anymore, so what are we going to do now? leila, i think it is a very serious thing. the violence is really shameful and we need to think about it...i was very surprised to see this and maybe we should pay more attention to things that are changing around us. Seriously I've only heard of Lego and Suntop brand around where I'm at, Dina. 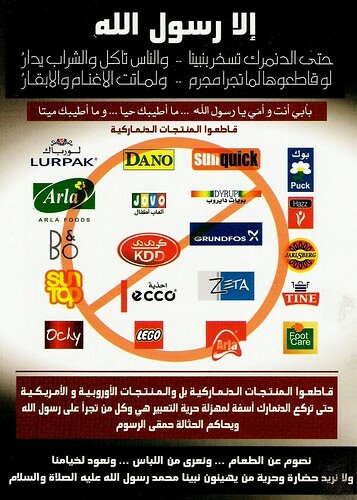 I think the first level of our reaction towards the danish cartoon issue is to demonstrate and boycott peacefully. yes ..you're right it's the most civilized way to do...and our products are good,though some of it are disgusting! Hi Dina! Haven't heard from you for a long time....hope you are doing fine...take care!